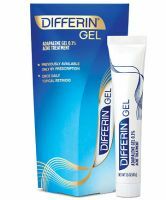 I used to use the prescription form of Differin back in the day (it's .3%) as opposed to this which is .1%. I use it to spot treat my acne and it definitely shortens the life of pimples. It can be a little drying if you use it all over, which is why I only use it on the blemishes themselves. This is a review for the over-the-counter version. I first got this as a tiny free sample, which I used as a spot treatment. I didn't like the way my skin healed after using this; it looked burnt where the pimples used to be. Since it is not meant to be a spot treatment, I decided to buy the full size and apply according to the directions. Differin does work. When I broke out, it was mostly in...read more places I hadn't applied Differin, like the ears, hairline, body, etc. When used all over the face, my oily skin was still oily, but with some flakiness and peeling. The directions do warn you that it will be drying. I could use it as a spot treatment, but I don't like the way it leaves dark scars behind. The gel is clear and absorbs pretty quickly. You shouldn't use this too quickly together because it could dry out your skin. I've only used it on spots so far and it's drying out the pimple fairly quickly, making the cycle of it shorter. I was unsure and hesitant at first but I'm completely won over and am amazeddddd! !